Give me Delta, AA, or SW please. There have been planes where part of the roof came off during flight. 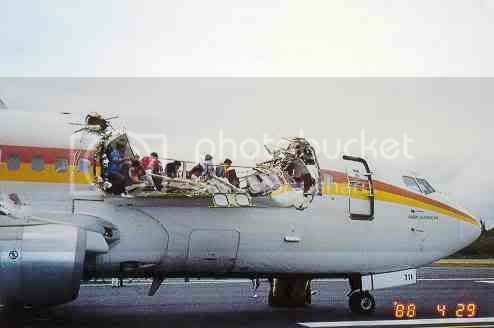 An Aloha Airlines flight had that happen. Yep. That was an explosive decompression caused by fatigue, but the fuselage didn't break in half. They just got a really bitchin skylight. This incident brought about changes as to how often aging aircraft are inspected for metal fatigue and corrosion. Although it was catastrophic and one flight attendant died, the airplane held together and was able to land. BTW… this is the same basic airframe involved with Caribbean Airlines Flight 523 proving that it had an incident on the ground right after landing (the photo shows the engine thrust reversers still deployed as they would be after landing). There goes that 'F' word again. Wonder where I saw that earlier in the thread. There's a rather large difference between a chunk of fuselage ripping off and the entire fuselage failing completely and breaking in half, Frankie. Look, you made a rather humorous goof. Just laugh it off like the rest of us are. I fear that you may be right. At least he has the common sense not to post in here again. My goodness. Was the Ken doll able to eject? I couldn't tell. I see something eject at precisely 17 seconds. Way to exaggerate, dude. And what is my "agenda?!" All I indicated was structural fatigue and lack of proper maintenance can happen and yes it's scary. You guys just went to town with a small issue topic. No, you foolishly thought that a commercial aircraft could have such a failure while in flight (apparently). Did you really think that was possible? But it's broken in half!